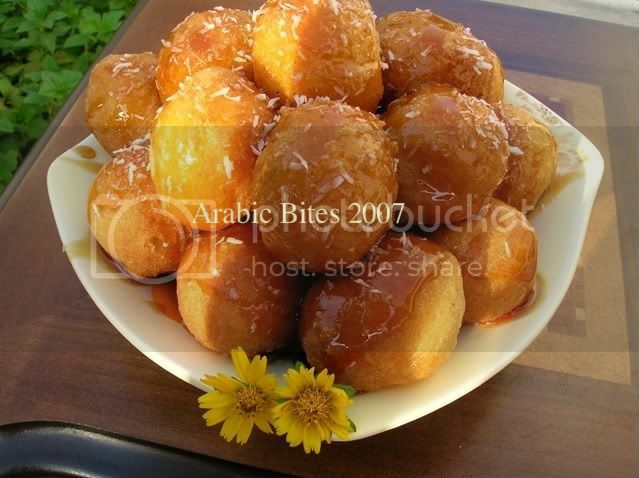 Traditional sweet in arabic gulf area especially in Ramadan. Elqaimat mean in English (small bites). Everyone in my family makes Elqaimat , but with a difference in taste and shape. My mother and I make it the same way, we form it into medium ball. but my grandmother make it like a disk shape. 1 Tablespoon low-fat dry milk. *Flavor options:you can use coconut extract instead of vanilla extract,or ground cinnamon instead of cardamom. 1)Mix all ingredients in a bowel ,cover let it rise for 1 hour up to 4 hours. 2)Deep fry it in hot oil using tablespoon to drop the dough,or by your hand, until browned ,drain on absorbent paper. 3)drizzle with date molasses and sprinkle with coconut. I think I would also form into medium ball. welcome & thanks for the comments. very lovely! my cousin made this quite a long time ago, learned the technique from her servant, i must say i'm hooked! Mmmm, cardamom and saffron -- that sounds lovely. I will try your recipe as you posted it, and maybe will try different sizes and shapes as you suggest. Thank you for such an intriguing recipe! eliza, I had fun shape all these elqaimat by my hand. threetates,try it you will love it ,it is so easy to make,my dad always request them.if you try them let me know how it works? I will try this today. I will have to do some substitutions though because I don't have powdered milk and date molasses. I will post my review. So I did try it and I used 1/4 of milk and reduced the water to 1 1/4 cup. Also I used vanilla extract instead of vanilla powder and made a syrup instead of using date molasses. I don't know if those first 2 substitutions had an effect on the quality of the elqaimat because they came out heavy and doughy and one burst in half while frying splashing hot oil all over the kitchen. We luckily escaped after we heard the first pop. I don't know if it was the extract, the high heat, the combo of yeast and baking powder, etc. It was strange that it occurred to only one and we were at the end of the batch. Anywho the first ones that were fried were crispy outside and airy inside. The remaining were not. How does your come out? Liquid milk Cause the dough to browned fast without fully cooked inside. For this reason, I always use dry milk & always the result just perfect. As you see in the pictures my "Elqaimat" lightly browned & very airy ,it's just need some practice ;) & it'll come out perfect for you. InshaALlah this weekend im goint to do it, but tell me, theres some sirup on it??? or maybe the Elqaimat is so sweet??? Enjoy the recipe I'm sure you will love it. Elqaimat is not so sweet,so you need to serve it with date molasses like we do in Arabic gulf & if don't have it you can use gold syrup or any syrup you like. 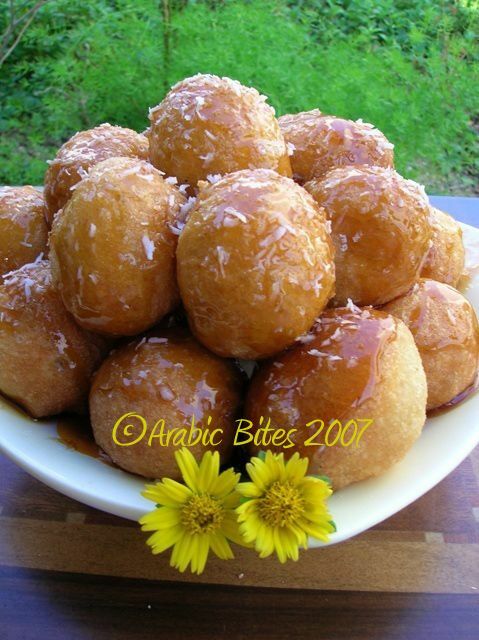 Zinab, thank you for the recipe. I deep fried elqaimat(s?) today - for an "arabic cuisine week" on polish blogs (http://przyduzymstole.blogspot.com/2009/03/elqaimat-mae-kaski-na-ramadan.html). Turned out very tasty, crunchy on the outside and soft inside. I used semi skimmed milk instead of a dry milk and water - so I guess the key is the right temperature, lower that for french fries, 170C I think. yummm!!!!!! we tried this @ home n it was an instant hit! !it was crisp outside n airy n soft inside..i used sugar syrup instead of date molasses.. so i'd say-go for it people!! This looks great. But can you please help me? 1 cup; is that 125 ml?? Please answer me, so I can make them too. What kind of yeast do you use? Dry yeast?? The 1 cup of flour I used = 143g. & the yeast I always use instant yeast.